A couple of Sundays ago, I went with some friends to Westham Island, just outside of Vancouver. It’s one of my favorite places accessible across a single-vehicle wide wooden bridge and once you’ve crossed over, you’ll find an herb farm, a few few berry u-picks, a couple honey producers and a bird sanctuary. Heck, there’s even a gun club in case you’ve got the itch. By the time we left the island, the trunk was full of potted plants, local raspberries, new potatoes and a huge bag of fresh sweet peas. After staining my fingers red from dipping into my raspberry stash, I moved onto the main event. 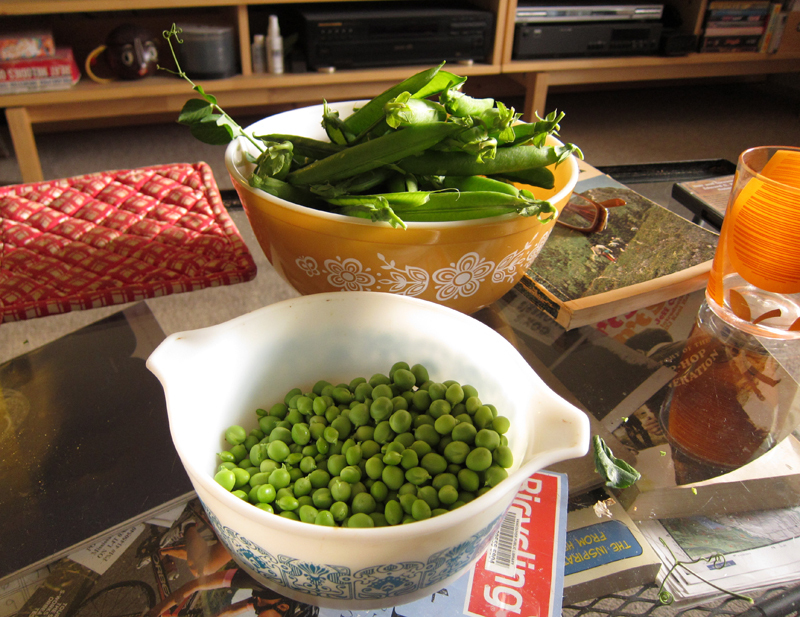 Cornelius and I turned up the stereo and got to shucking the pound or so of English sweet peas. We made short work of it, laughing and reminiscing about childhoods spent at kitchen tables doing the same task under the watchful eye of grandmas. 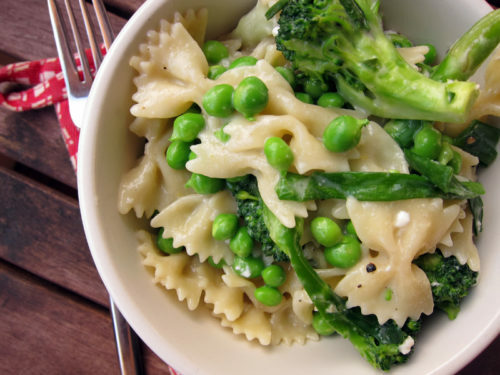 Once we were done, I hadn’t really figured out what I wanted to do with the peas, but dinner was calling and pasta primavera seemed like a good idea. Our CSA provided the broccoli and green onions and I spied a container of ricotta in the fridge. Perfect! I really wanted the sweetness and crunch from the peas to be the standout, so I added them at the very end of cooking because nothing beats the goodness of raw peas! The meal came together quickly and could be easily adaptable depending on whatever vegetables you’ve got on hand. Sweet colourful peppers, summer squash, even chard or spinach would tasty additions from the garden. I used some fresh oregano here, but I’m sure any herb from your garden – dill, basil, parsley – would be wonderful. I only used a half lemon here, but if you’d like more of a lemon punch-up, add in some zest to brighten up the dish. In a large pot, bring salted water to a boil. Add pasta and cook covered on med-high heat until half-cooked. Add in the broccoli and cook for 2 minutes. Drain, leaving about 1/2 cup of the cooking water. Add in the chicken stock, garlic, green onions and simmer for a few minutes over low heat until sauce thickens and pasta is al dente. Stir in the fresh peas, parmesan, ricotta, fresh oregano and cook for 1 minute more to heat through. Spritz with lemon juice and add freshly ground pepper and salt if needed. Serves 2. There’s something almost zen about shelling fresh peas, no? I know that bowl, too. From my mom’s kitchen, where it has been filled countless times with fresh veggies bought from the farm stand down the road. This sounds so light and fresh. Fresh peas had to make that divine! ! I’ve found a great tofu ricotta that would be perfect for this! 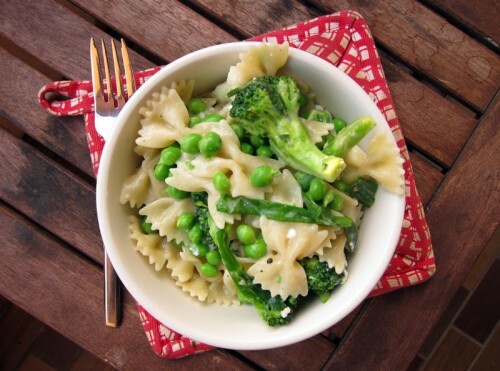 Such stellar ingredients as fresh peas deserve a simple pasta like this! Delicious! So fresh and summery – I love this! Yes, with a good tofu ricotta, this would be an excellent vegan dish, Michelle. Joanne, yup, best not to get too complicated here. Such bright pretty peas! Lovely summer dish. This pasta just screams Summer! It looks delicious! I picked up some fresh peas a few weeks ago at the farmer’s market and I enjoyed eating them both fresh and lightly steamed. The steaming actually made them even sweeter which I’m partial too. So good! Will have to try adding the fresh peas to pasta next time. This looks delicious, nice and light for summer. Thank you for visiting the blog. Its been lovely discovering yours, great recipes and photos. Yum, wish I could eat some right now! Simple summer pastas are where it’s at. That island sounds pretty heavenly. Thursday Girls, thank you for stopping by! Kimberly, that island is pretty wonderful! Thanks. I hardly use ricotta outside of lasagna, so it’s great to see it being used in this way (much easier than making a brick of lasagna, too!). We’ve been thinking about making our own ricotta, actually—have you ever tried? Lulu, that sounds wonderful! Enjoy. This seems like the perfect summer dish… YUM! Thanks nyc food photographer – it’s easy and tasty, what’s not to like? Yumm fresh peas!! My mom lives near Westham Island. 🙂 I love the sound of this simple green creamy pasta. Mmm..just made this for dinner tonight. Thanks for the recipe! If I can’t find fresh peas, how would edamame be as a substitute? Sarah, you can easily use frozen peas and edamame would be fine too! Thanks for sharing…wish I had been there with you. One thing…shucking is for corn….shelling is what you do to peas and snapping is what you do to green beans. Aren’t you lucky to have them….wonderful! Fresh is always best.